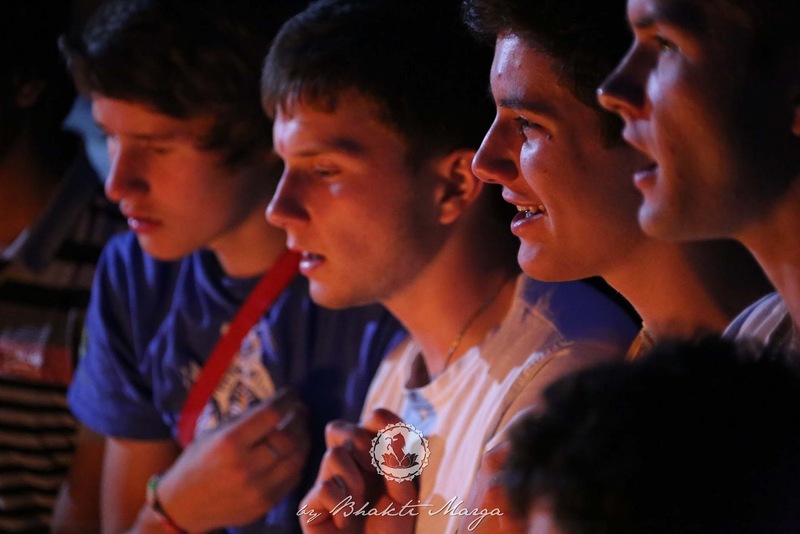 For me, the final four days of the Summer Youth Sangha 2015 were unforgettable. 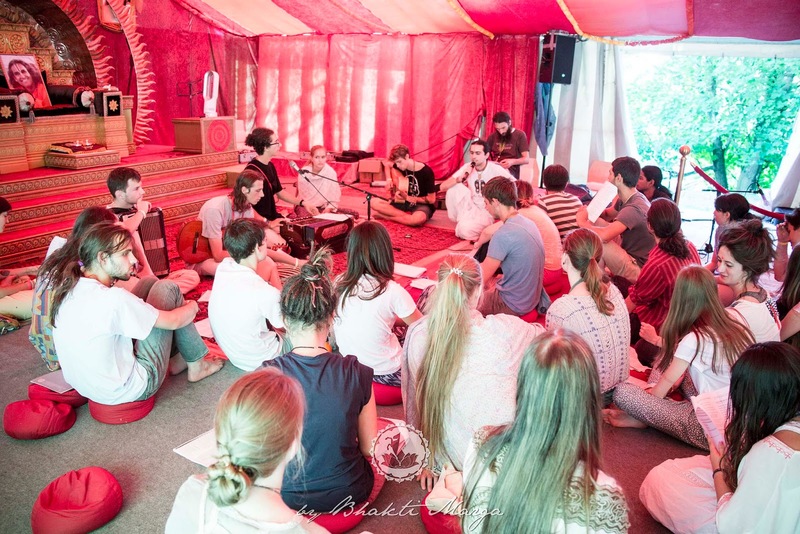 Our group of 86 teens and young adults from over 12 countries dove deeper into spirituality with classes that gave us tools and practices that would change our lives forever. This was unlike any summer camp any of us had ever been to before--this was wildly intense. 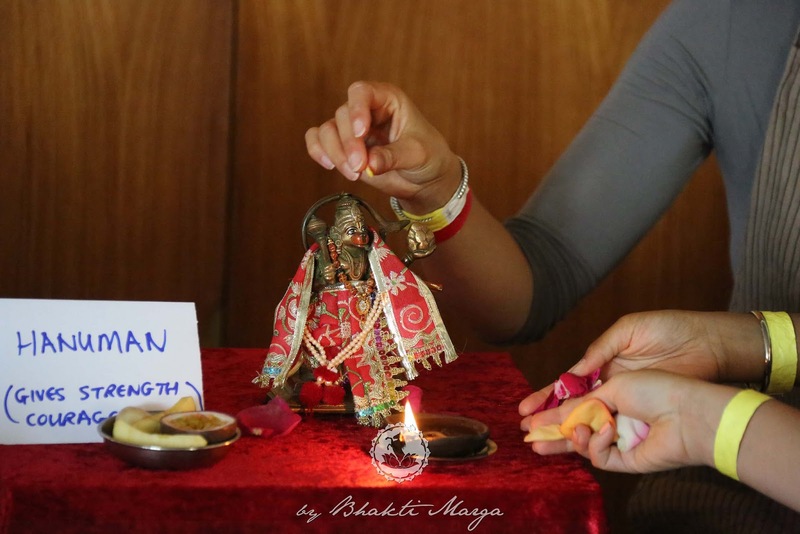 We had the opportunity to learn Archana Bhakti, ritual, in a puja course taught by Swami Anashuya. 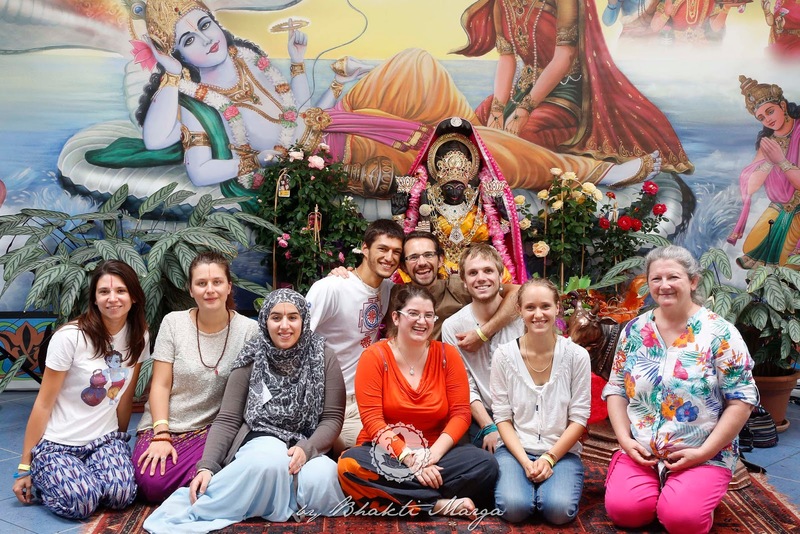 In this class, we learned to give offerings to murtis (statues of deities). 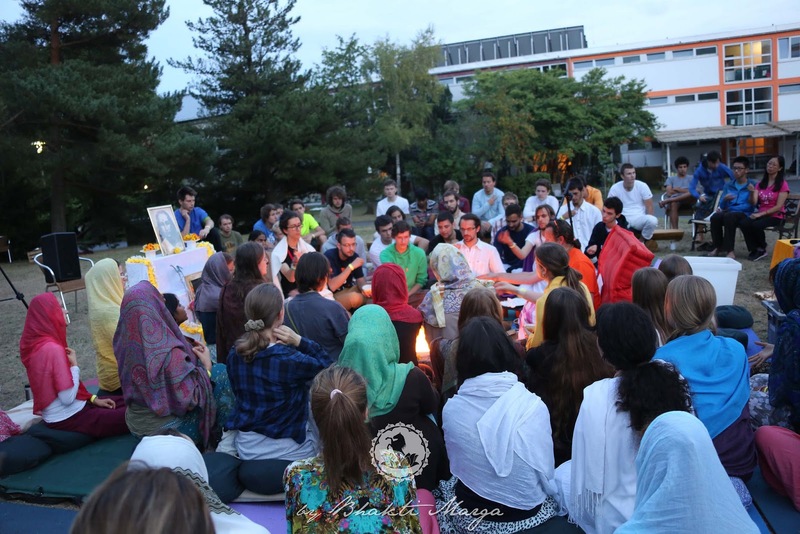 For many, this was the first time of practicing a ritual like this. 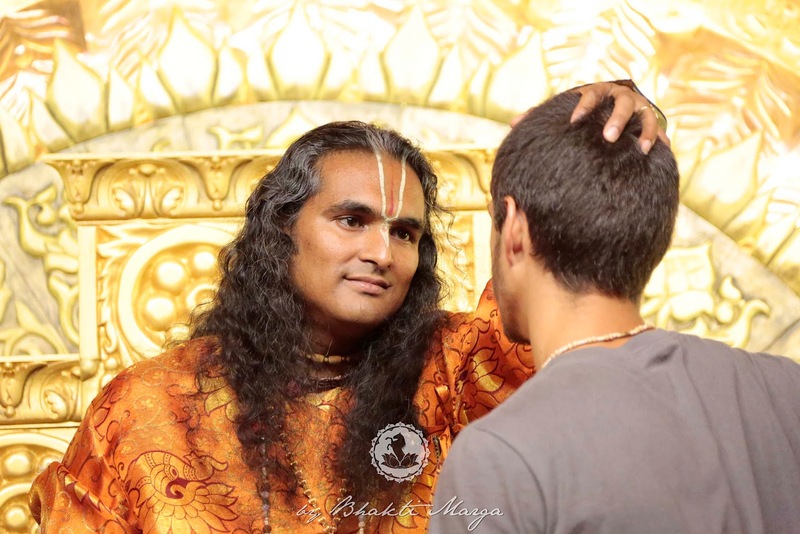 It made sense when Swami told us that it is a great way to create a personal relationship with the Divine. We could all use more of that, right? Here we offer rice and flowers as a part of the puja. 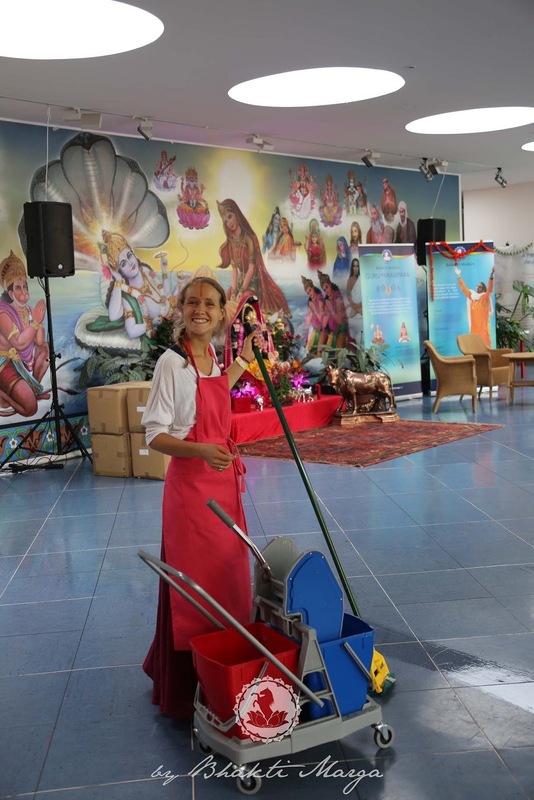 Yes, even seva can be fun. 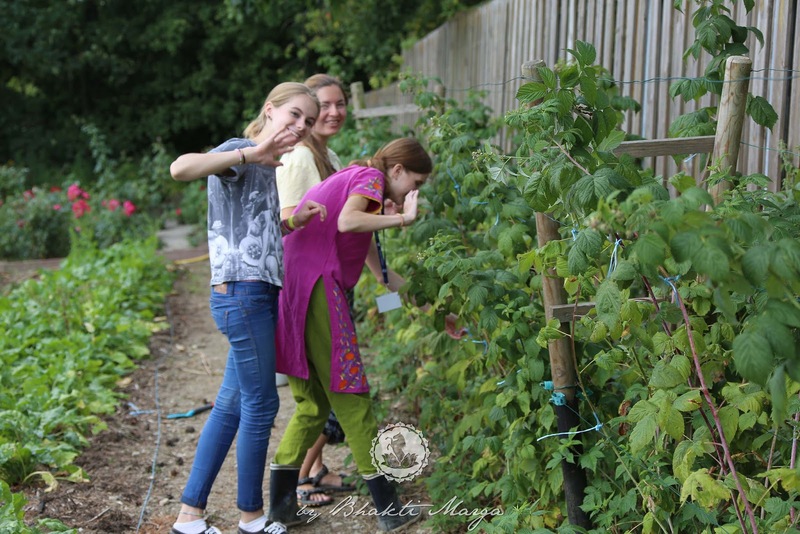 We helped Shree Peetha Nilaya in a variety of ways by spreading out all over the place. Some of us gardened, cleaned, worked in construction (or demolition which was awesome) or cooked. 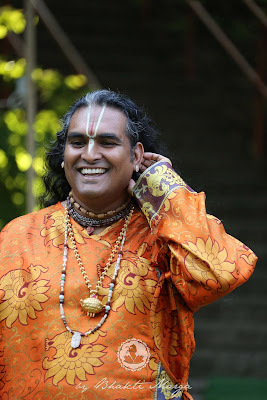 The focus during music classes was rigorous, due to the "deal" Sri Swami Vishwananda made with us: in exchange for Darshan, we had to sing the entire time. That meant we really had to practice hard to learn whole bhajans. We did not want to embarrass ourselves in front of Guruji! It was not easy for all of us. After that, we ended up with a greater appreciation of those amazing musicians and singers of SPN. 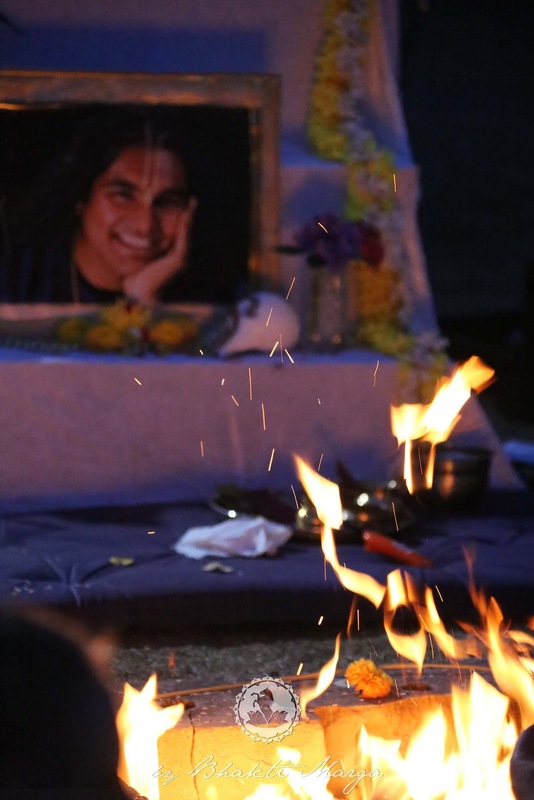 That evening, Swami Keshava led a yagna (a fire ceremony) dedicated to Babaji. We chanted "OM Namo Narayanaya Swaha," as the main mantra for the night to honor our lineage and Divine Mother. After the fire ceremony, residents asked what we thought about the yagna. Most all of us would agree: it was awesome. There is something pretty magical about chanting and feeling the energy of the fire. On this day, the temple was full for morning prayers, as the sangha got increasingly enthusiastic about the opportunity to wake up with the Divine and sing for them. It's nice to have a lot of voices during morning prayers! The day continued with a focus on the arts. 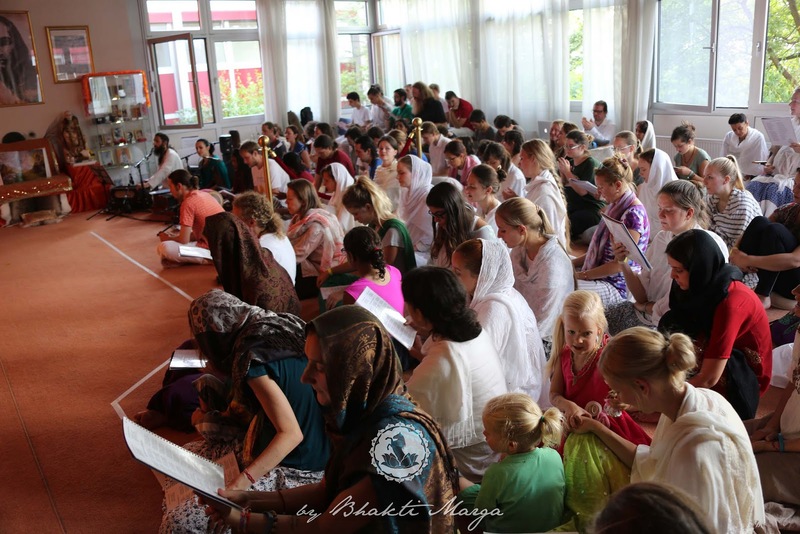 In music classes, kids practiced the bhajans planned for the Darshan on the following day. Others started spiritual drawing with the guidance of Jaahnvi. Here she is, giving some feedback on an artwork in progress. 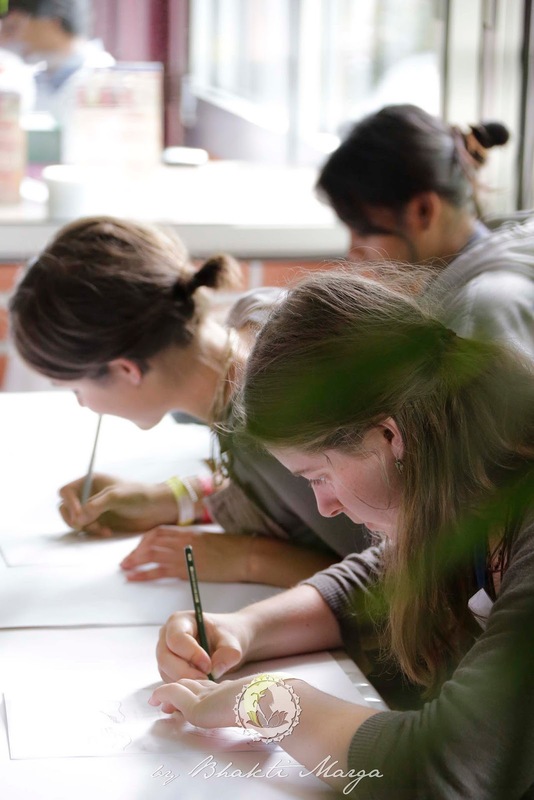 Talent and teaching combined on this day, and many wonderful pieces were created as a result. 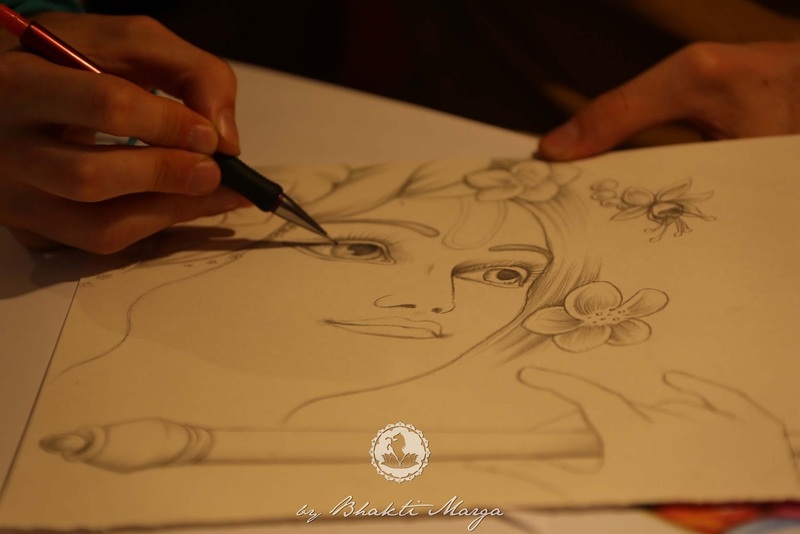 Many got to show their talents through painting and drawing pictures of the Divine. Jaahnvi mentioned the skillfulness of the artists as a collective. 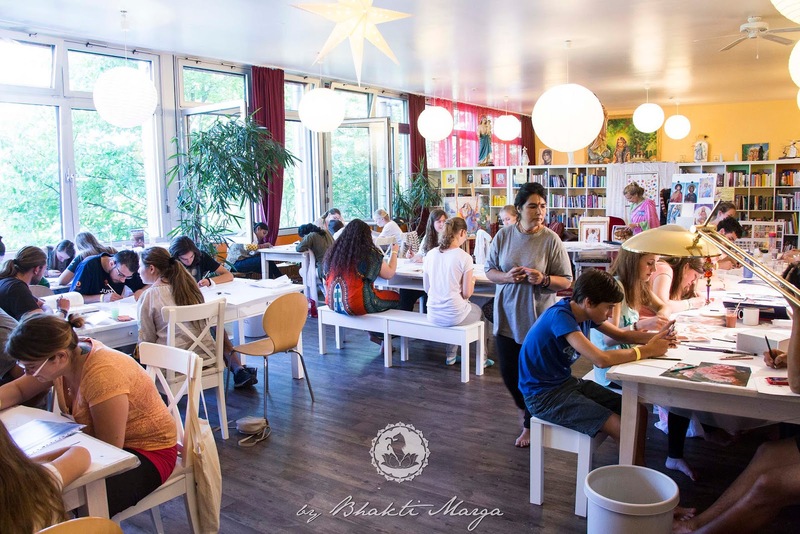 The Bhajan Cafe turned into an art studio for some time. Another new experience for many of us was Hatha Yoga. Chaturananda taught poses that balanced the body and explained that bowing to the Divine can be a very beneficial practice in many ways. Here he is showing us some poses to work on. Looks easy, doesn't it? We learned that balancing the body is as important as balancing the mind. By now, the pace was really rocking. Preparations were being finalized for the spontaneous decision made by Guruji early in the week to give Darshan. 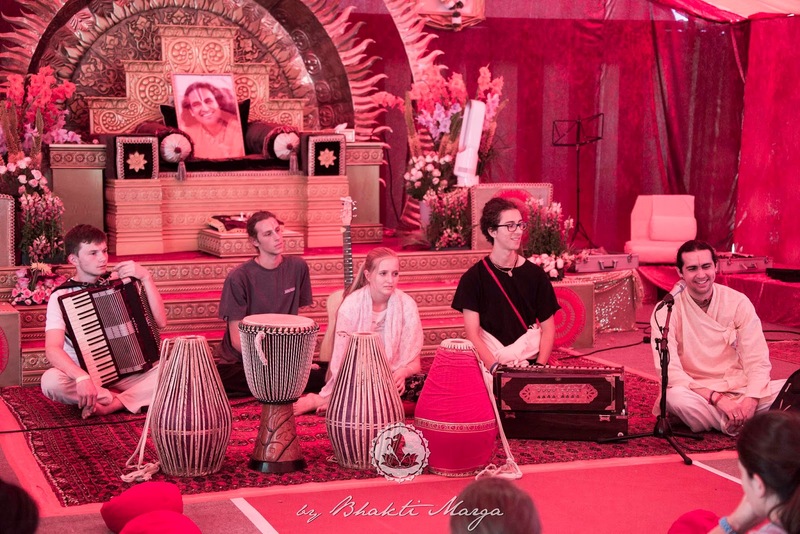 Songs were practiced and memorized for the Darshan later in the evening. 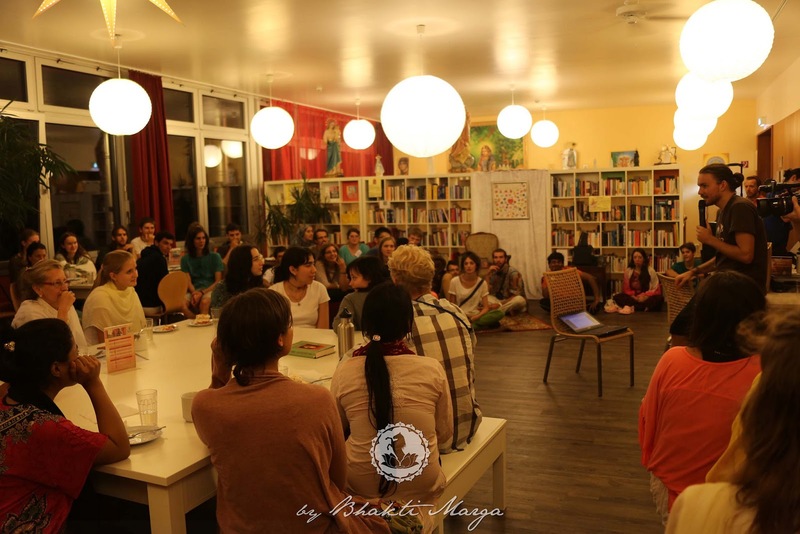 But, people leaving early were still able to have time with Guruji and discuss what we learned during the week. It was special that everyone got some personal time with Him. 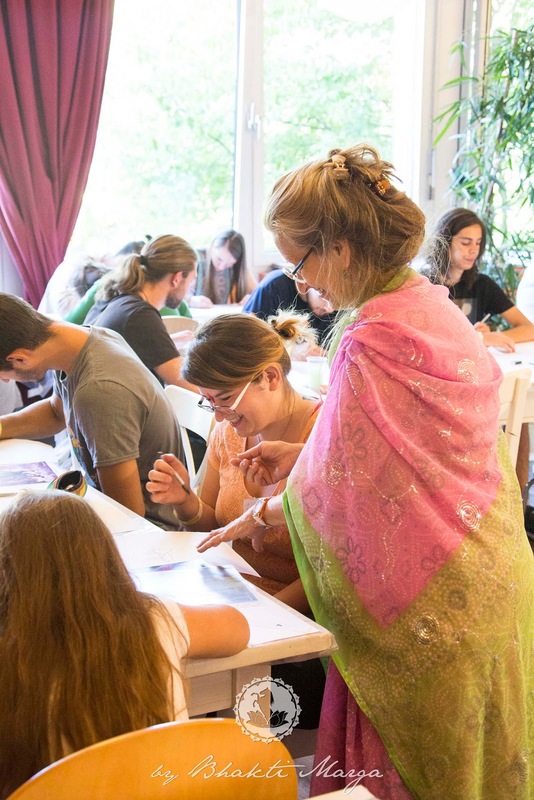 Swami Vijaya discussed how to live spiritually after we leave for home, and how to continue what we've learned despite living outside of the ashram. Lots of participants felt this discussion was one of the most important during the entire week! 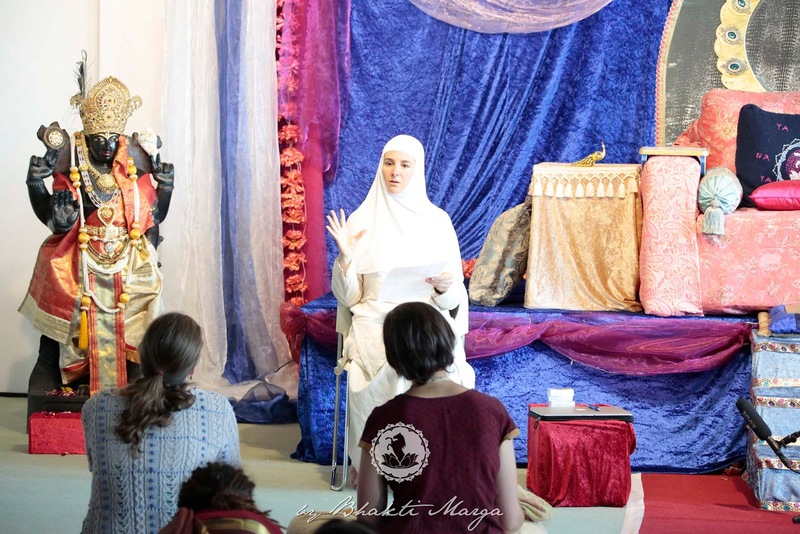 Mother Seraphima gave a discourse on Orthodox Christianity and similarities between traditions of Hinduism and Christianity, and Christ and Krishna. 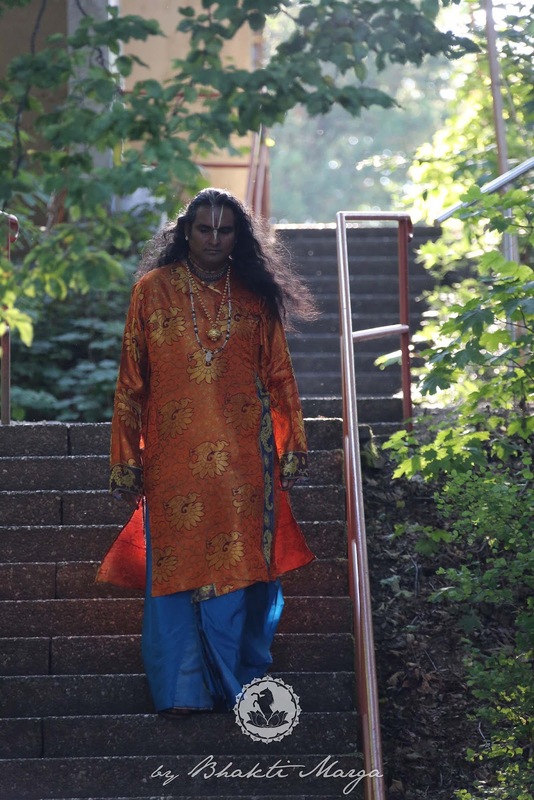 You literally could hear the gasps as Sri Swami Vishwananda arrives for Darshan. Stunning. Guruji started with an enlightening satsang. 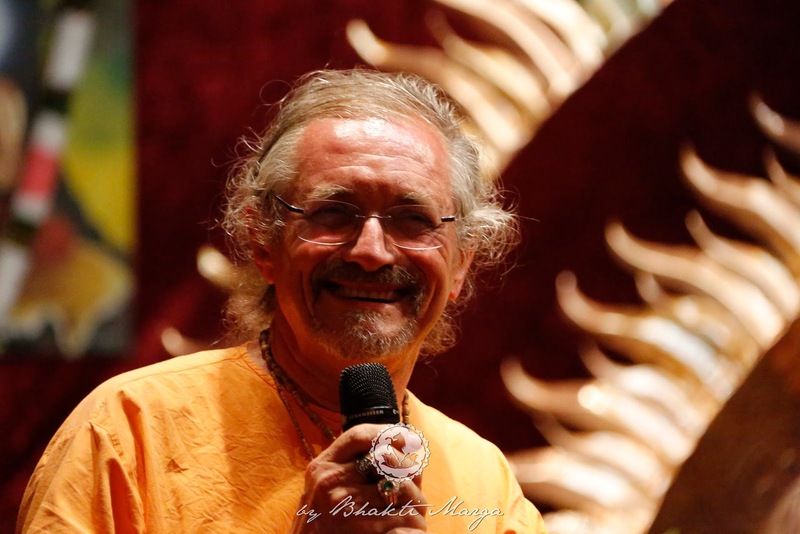 It was obvious that he was having lots of fun as he answered many of the questions the sangha had been formulating for him during the week. 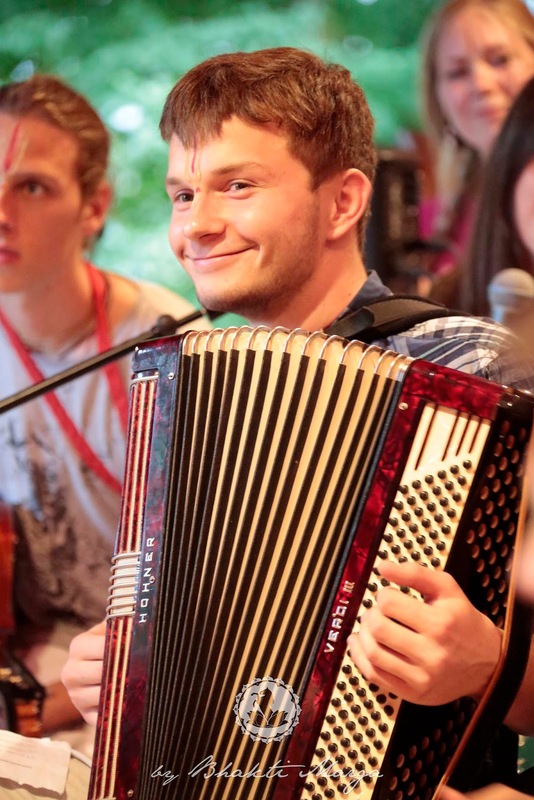 The group really enjoyed playing for Guruji and for each other, fulfilling the promise made between Sangha and Swami. 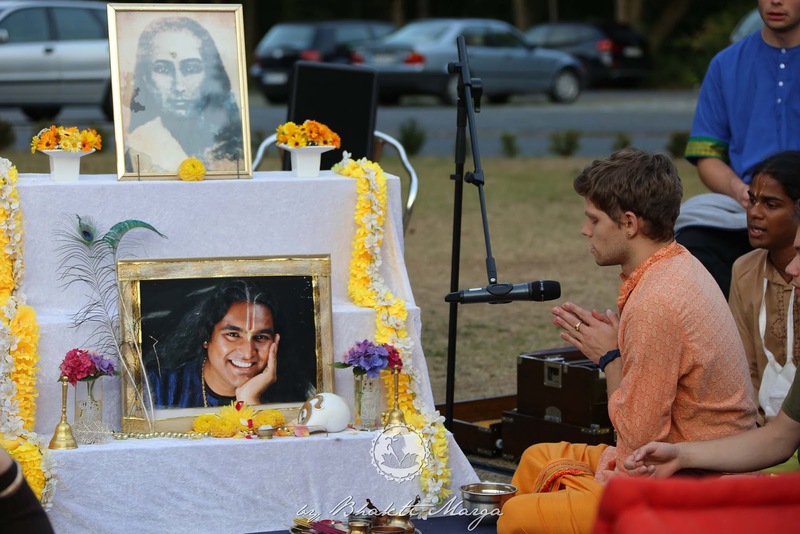 Day 7: 9 Forms of Bhakti with Tulsidas, All About Guruji! 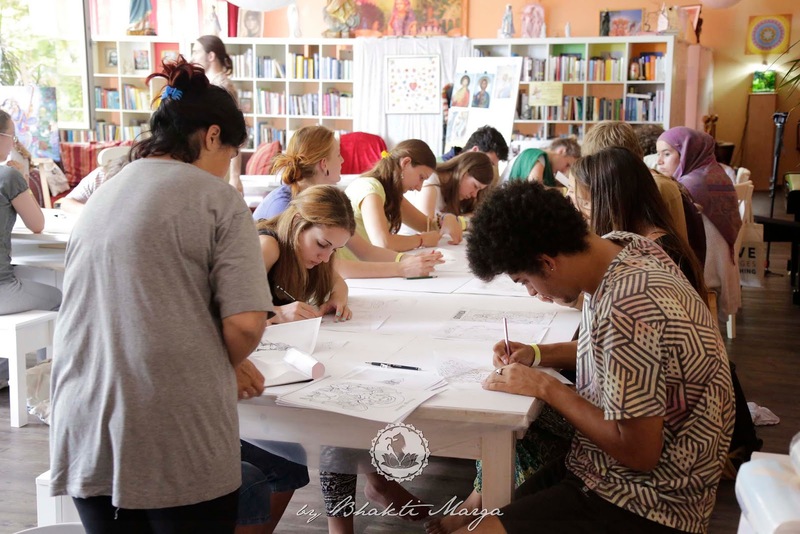 Prayers, seva, and art workshops continued as the previous days, but the Day 7 bhakti classes were all about Guruji! 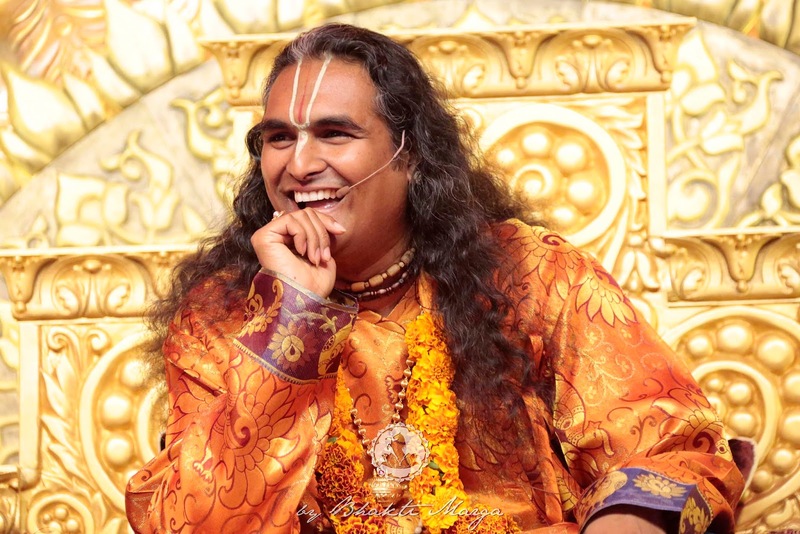 First, Tulsidas taught us about the 9 forms of bhakti and how they relate to Sri Swami Vishwananda's mission. 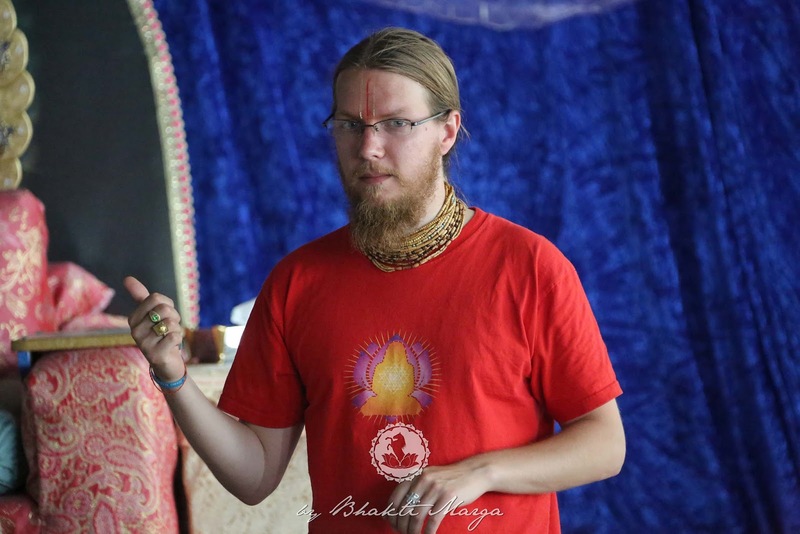 His talk described how all our activities we did during the Summer Youth Sangha related to the forms of Bhakti and how they relate to our progress and to the Guru. Tulsidas taught us about the forms of bhakti. Later, Swami Anashuya read stories that Guruji's family wrote and compiled. The accounts included miracles, important events, and stages of his life. 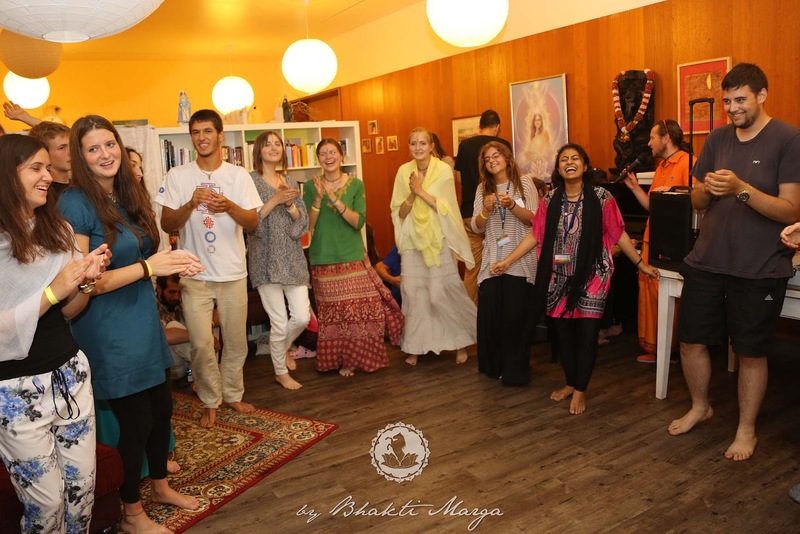 This helped get us all ready for a big quiz about Bhakti Marga and Guruji that would take place later that day. We ended up really enjoying hearing about Guruji, his mission, and getting tested on what we knew. Totally enchanted by the stories about Guruji. The stories of funny moments in his life, his pranks, his Love for the Divine, his miracles and his mission, absorbed the attention of us all. The pressure is on! The quiz had some tough questions that regarded scripture as well as our lineage. The night carried on after the quiz as we played jump-rope, danced, sang, and ate cake. When it got too late to continue with the noise, Swami Anashuya told us more amazing stories about Guruji's life. 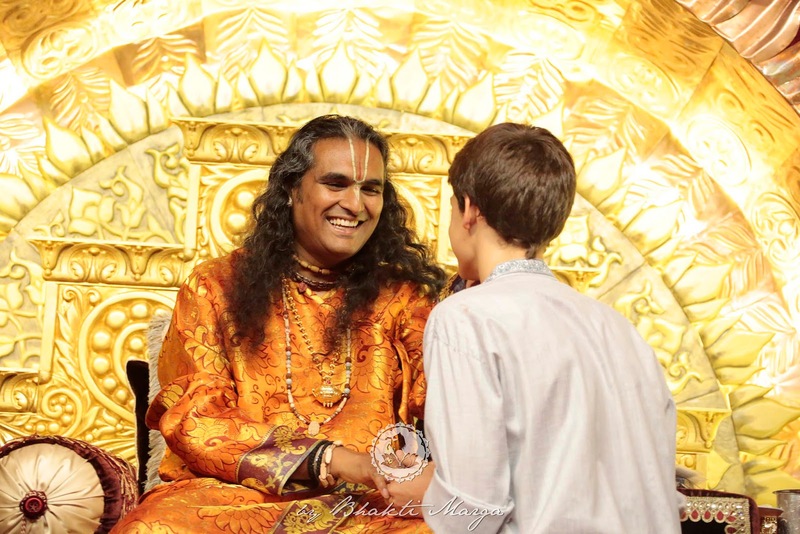 Swami Anashuya and several kids told their own stories about finding their spiritual path, exciting stories about Guruji, and how he has impacted their lives so positively. Ultimately, the night was a festive time, even with the knowing that we would soon be separated and have to go back to our daily lives the following morning. The day started with prayers that went extra late, as leading musicians and singers from the sangha got to lead both prayers and bhajans. Sad but sweet, the goodbyes were tough as we had all made great friends. But we left with one important thing: the support we all received for our spiritual lives. No matter what happens to us now, we know who we are, we know where we came from, where we can go back to and we know where we ultimately belong. Before we left, we all noted how happy we were to meet each other. We mentioned our hope to stay in contact and to help each other along as we move on in our lives. 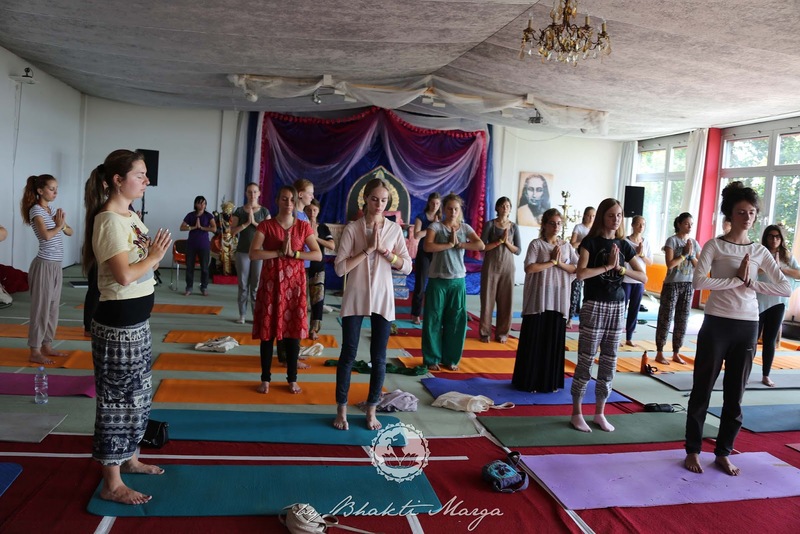 This amazing experience of the Summer Youth Sangha of 2015 will be remembered and cherished for a very long time to come. Since we have moved on, we have been talking and answering each other's questions, and updating the sangha on what we are up to! So, we have maintained the sangha even outside of our time at the ashram.